“QUALITY SOUL music and people having a damn good time” in a city with “a great history of soul events”. This is what DJ Paul Grant says can be expected when the Galway Bay Soul Weekender hits the city at the start of September. The founders of the Galway Bay Soul Weekender are Paul Mulholland, who has been DJing in Galway and Dublin for more than 25 years, and Darren McDonnell and Paul Grant, founders and DJs at Pow City Soul Club, Dublin. All three bring a lifetime of experience with the music, having grown up on soul. Paul Mulholland came to it via listening to The Jam and 2-Tone Ska, resulting in “a hunger to discover what went before it”; Darren’s childhood included “Sundays in my Granny’s house, hearing Motown on the radio – not knowing what it was, but enjoying its infectious rhythm and catchy lyrics”; while Paul Grant discovered it through his older brother's record collection. The Galway Bay Soul Weekender runs from Friday September 1 to Sunday 3 - and includes a boat cruise along Lough Corrib as well as DJ events in The Blue Note and Seven. Joining the festival founders on DJing duties will be Greg McAlinney, Steve Thomas, Keith McCafferty, Karl Mitchell, Shane Walsh, Tony Doyle, Dave Barry, and Liam Evans. So what led a Galwegian, a Tipperary man, and a Dubliner to come up with a Northern Soul festival for Galway? “After witnessing the great success the Disconauts have had down through the years with their boat parties, plus the similarities between the dance scene and the Northern soul scene, I thought this might be a runner,” says Paul Mulholland. The festival begins on Friday 1 in The Cellar Bar from 9pm to 1.30am, with pounding sixties soul and gritty ghetto grooves. Saturday 2 will see a record fair and DJs playing smooth soul in The Blue Note’s beer garden from 1pm to 5pm. From 6.30pm to 10.30pm a private chartered cruise, starting from Woodquay, with full bar and Funktion 1 Sound System, will sail Lough Corrib. The festival ends on Sunday in The Blue Note from 2pm to 12 midnight with Soulfood BBQ and Soul Sounds. A word of explanation - northern soul is a unique genre. The records northern soul DJs spin are usually records made in the 1960s, in the Motown style, by American artists who had only regional hits or released a handful of singles, mostly on independent labels. These records fell into obscurity, but in the 1970s started to come into the hands of collectors and DJs in England on the hunt for fresh and unusual dance tracks. They found an enthusiastic audience among the northern English working class, who would travel the length and breadth of the north to dance to this music at what became known as ‘all-nighters’ in places like the Wigan Casino, Manchester’s Twisted Wheel, and the Blackpool Mecca. The scene seemed to peter out towards the 1980s, but recent years has seen it make a strong comeback, and now looks here to stay. 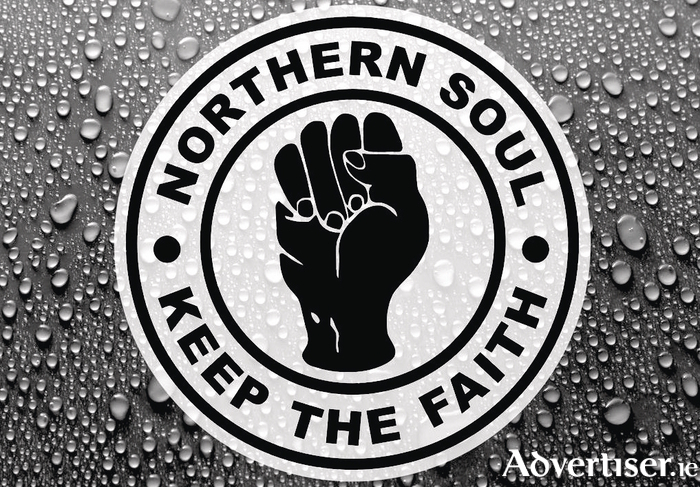 No discussion of northern soul is complete without asking the festival founders what their favourite Northern Soul 45" is and if there is any chance they might play said track over the Galway Bay Soul Weekender? Tickets are available at billetto.ie and on the door. A weekend pass including boat cruise is €25. A weekend pass for Friday and Saturday is €12.